Facebook comments from people who never went to Charlotte lead me to believe there is no issue with name confusion. Long before the sun has thought about rising, the lights are blazing over Jerry Richardson Stadium as the Charlotte 49ers football team begins its spring workouts. clt asks why does the school not adopt our own branding for athletics? Cruz is our ace in the hole. He is a difference maker. I’m SOOOOOOO glad and proud this young man is a NINER. A true fan would attend their normal 5:30am practice. I’ll be out for the 5:30 again next week. 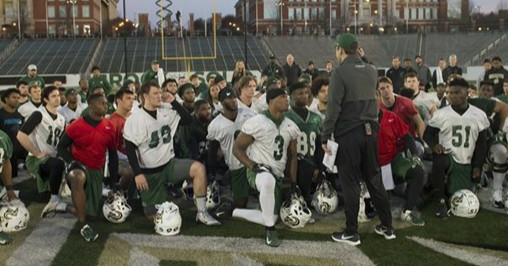 The Charlotte 49ers’ first spring football scrimmage was played out in front of several hundred fans, alumni, family members and recruits as part of new coach Will Healy’s open-door and all-access policy for the program. Shirrefs went with the 1’s, pope with the 2’s, reynolds with the 3’s. I thought pope was the best of the group on saturday. every dog has his day though. With the first scrimmage of spring practice in the books, let’s take a look at Will Healy’s 49ers. Healy sat Tucker and Lemay to keep them healthy and to get new guys reps. Glad he’s taking care of those big time guys.